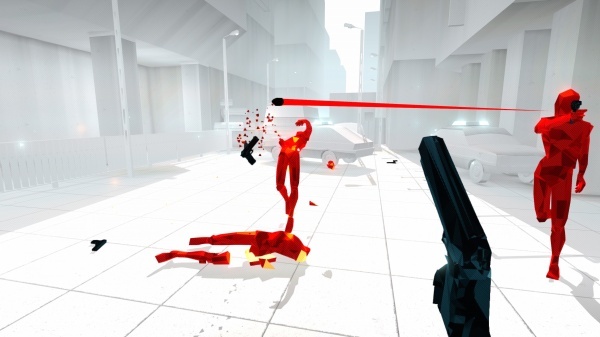 SUPERHOT is "the first person shooter where time moves only when you move". Well, I wouldn't quite call the game a shooter. Sure, there are guns in the game and the goal of each level is to stay alive long enough to kill everyone who is trying to kill you, but after playing SUPERHOT I consider it to be more of a puzzle game than a shooter. Each level in the game is a self-contained encounter set in a small indoor or outdoor environment filled with a number of enemies who will try to kill you. You'll always be severely outnumbered, but you have a significant advantage over your enemies in that you set the pace of the battle by controlling the flow of time. Nothing moves unless you do, and the pace at which it moves is set by your actions. Look around or adjust the aim of your weapon and time crawls forward at a minimal rate. Take a step forward and time steps forward with you. Reach for a weapon or object and time takes a larger leap along with your action. Try and make a run for it and time will run right along with you. This power over the flow of time has a few consequences. You'll need to think before you act, anticipating the actions of your enemies before you let time move forward and allow them to complete those actions. Mistakes are fatal - this is a one-hit kill environment and if you die you'll restart the level from the beginning. You'll need to be especially careful as to when you fire your weapon. Leading a target can be particularly tricky when it's hard to gauge how fast your target is moving because it's only moving when you allow it to, and you don't want to waste any bullets. First of all, a miss means that you've wasted the time that you have already moved forward, giving additional enemies the time that they need to converge on you. Also, the weapons in the game have tiny clips and can't be reloaded, so each and every shot counts. But these disadvantages are tempered by the large advantage that you have over those who are shooting at you. Freezing time also freezes bullets in flight, leaving them suspended in the air with tracer-like trails behind them that let you determine their trajectory which allows you to deftly sidestep the bullets without the need to go through a series of Neo-like contortions. You also have the luxury of having all of the time that you would like to plan your next move, staring at a frozen world, assessing which threat is the most dangerous at the moment, and then formulating a plan to deal with it. In spite of your huge advantage over your enemies, you'll rarely make it through a level on your first attempt. The game delights in sending enemies into a level from behind you while your attention is focused on those in front of you. This is a no-win situation; you have to take care of the immediate threats and can't allow them the ability to move while you look around to scan the area, so enemies can easily kill you from behind. And you can't rely on audio cues like you can in shooters to let you know someone new is rushing into the room because there aren't any, although I suppose that they would sound like something out of Inception if there were. The levels play out the same way each time, so at times it is simply an exercise in trial and error, replaying a level a number of times until you get the full picture of when and where each enemy will enter the picture. While I like the base concept here - the time only moves when you do conceit - I wish that the game's levels were more creatively designed and relied less on the "there's now someone behind you" method for adding challenge to the game. It's probably a good thing that the game is pretty short, because the game's novelty, which is pretty interesting at first, begins to wear off as you stutter step your way through one level after another to learn where and when the enemies will spawn. A puzzle game like this doesn't really need a story, but there is one in SUPERHOT that envisions that you're a late 1970s hacker who has stumbled on a secret game locked away on a corporate computer named, not coincidently, SUPERHOT. The story doesn't really add anything to the game, and, in fact, the game would probably be better off without it. It struck me as odd that a pair of hackers wouldn't be floored by the game's graphics in an age when ASCII art was the height of PC graphics. The game's minimalist graphics and a color scheme that colors enemies in red, weapons in black, and leaves everything else in white work well for a puzzle style game but they're way beyond anything you'd possible see in 1978. And I have to say that I found it annoying that the post-level replays continually flash the word "SUPERHOT" across the screen while a voice endlessly repeats "SU-PER - HOT - SU-PER -HOT - SU-PER - HOT ..."
The game is pretty short - you can probably finish it in a single evening - and it's not the kind of game that you'll have any interest in returning to replay the levels that you've already completed. To be honest, though, I don't think the game could have held my interest for much longer. It's like playing a tech demo for a cool concept that never went beyond the demo stage and became a full-fledged game - "that was a cool prototype, when does the real game come out". To compensate for its brevity, the game adds challenge levels and an endless mode after you complete the primary levels. They're essentially retreads of the game's regular levels, though, with added weapons restrictions or endlessly spawning enemies. I would have rather seen real gameplay and challenge progression throughout the regular levels than to be given the opportunity to play the same ones over again. There's a good idea here behind the game, but it's essentially squandered on poor level design, a lack of progression, and a terrible story that is shoehorned into the game and feels disconnected from the gameplay. Furthermore, the price of the game at the time this review is being written is $25, which is obscenely high for what you get, especially taking into account the pricing of other games on Steam. My advice is to wait until this game gets a major price cut, check out the whole "time moves when you do concept" (in) one evening, and then think about all of the amazing things that could have been done with that concept and how SUPERHOT wasted the opportunity to do any of them. 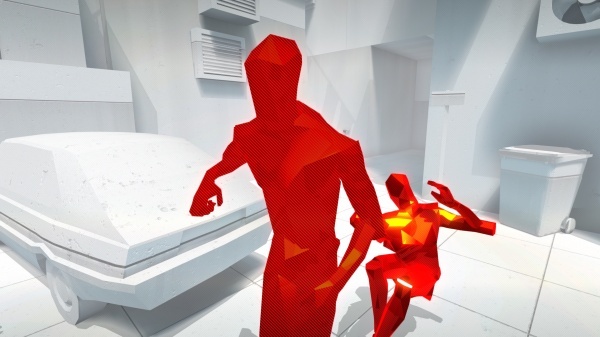 Final Rating: 68% - SUPERHOT is a good idea in search of a game.